No matter the season, we all feel a bit of build-up on our faces after a few days – maybe from heavy cleansers, moisturizers or stubborn makeup. In summer, it’s usually from sunscreens and sunny day sweatin’. 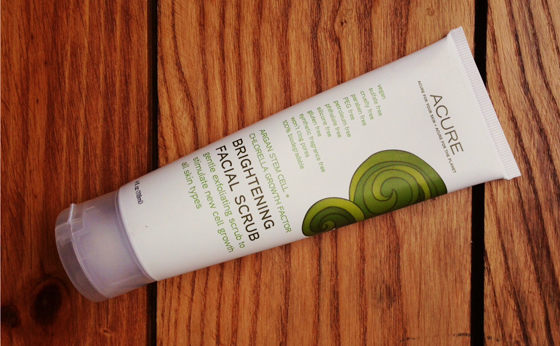 Acure’s Brightening Facial Scrub ($14.99 for 4 oz.) is PERFECT for easy exfoliation a few times each week. They’ve completely nailed it with this scrub – it’s not hard to see why this is Acure’s number one seller. Living without it now would make me a grumpy cat. I look forward to using it every few days! First off, it’s easy to use, and ready to use. Having a scrub that you can squeeze right into your hand without mixing up a powder mask or scrub with water is very handy. 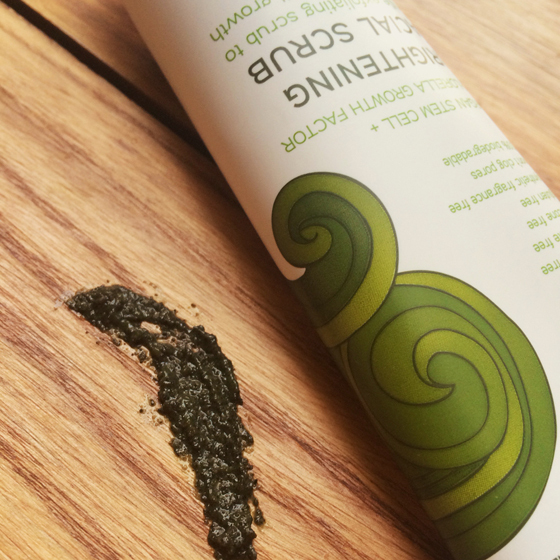 It’s a very gentle exfoliant made from sea kelp and dehydrated lemon peel (how great? So spongy! ), so it packs just the right amount of grit without stripping your skin or leaving you red and raw. French green clay gets to work on drawing out impurities. And with a little massaging, it produces a nice lather and foaming action, so you won’t miss your cleanser when you swap in this scrub. Ten out of ten on this one! This spray toner ($15.99) is so refreshing and so simple, with just six ingredients. Spritz it on after cleansing for a dewy base before applying serum or moisturizer. And check the purity on that ingredients label! Witch hazel, rosewater and vegetable glycerin are all items I keep in the house (er, apartment) for mixing into DIY toners and facial cleansers. They’re calming and gentle. Acure also adds in teas: rooibos and chamomile, and calendula (marigold) which supports healthy skin. I’ve been using leave-in conditioner sprays since I was a tween. They are a MUST for me: my hair is tanglier than a dust bunny you’d pull out of your vacuum. AND: I thought I’d have to swear them off forever once I switched to all-natural products. Acure Organics to the rescue. I love that this leave-in conditioner ($9.99 for 4 oz.) gets a nourishing boost from argan oil but is still weightless, detangling and conditioning without weighing hair down. It also has an invigorating, spicy scent that wakes me up in the morning. This is a product that I will be re-purchasing from now until the end of time. Without it, I’d probably be bald. My hair usually looks like a bale of hay thrown into a top knot or hiding underneath a bandana. I would love to blame genetics, but it has a little something to do with me going six months in between haircuts. GUILTY. Given that, my straw-like strands need a LOT of nourishment so I can run a brush through ‘em , and also look some semblance of put-together. Acure’s hair mask ($14.99 for 4 oz.) provides a major dose of moisture. You can use it a few times each week (or, really, on any super dry days, maybe when you’ve been washing your hair frequently). Just coat your hair in the shower, leave on for a few minutes, and rinse out. You’ll feel the difference immediately: ingredients-wise, Acure told me that “…the CoQ10 helps with keratin regeneration while the l-arginine is necessary for protein production in the hair.” Plus, good stuff like rosehips, vegetable glycerin and cocoa butter are working in your favor. Just don’t overdo it as this level of moisture ain’t messin’ around! Bonus: this is the best smelling product in my shower these days. Essential oils of rosemary and peppermint not only smell delicious, but Acure noted that they add shine, cut oiliness and are great for stimulation and circulation in the scalp. For my fellow ladies and gents rocking the scarecrow look, this one’s for you. 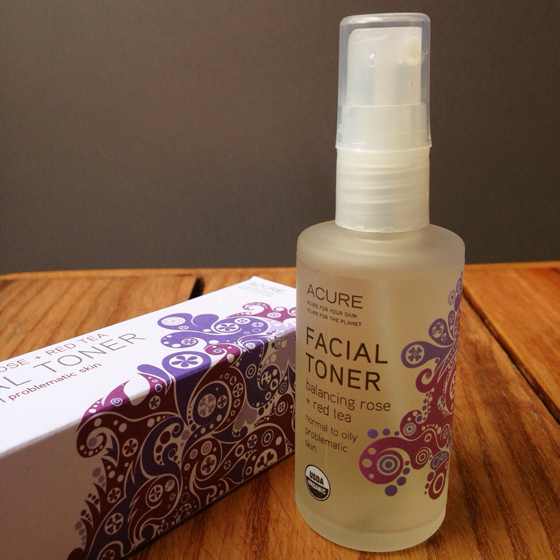 **All Acure products were generously sent to me for review by the product manufacturer. Check out our policy on product reviews. I love the Acure Leave-In Conditioner! I’ve also been hearing lots about the Brightening Facial Scrub. It reminds me so much of the Pangea Japanese Matcha Tea with Acai & Goji Berry Mask….I think these two combined would be heaven! Just looked that up – wow, me, too! Incredible ingredients. Thanks for mentioning that. Is it also sea monster green? Then they’d be a match made in heaven. It is sea monster green! That’s why I had to mention it! I’m in love with the Argan shampoo and conditioner and you’ve convinced me to try some other bits after reading this post! Perfect timing! Let me know how you like them! I just got my hair cut and the stylist asked me of not getting it cut in a year because it was so dry! (it was 2 months ago.) I’ll have to try these! Leave-in conditioners are such a lifesaver! I absolutely love your blog, btw, Kori! I seem to be the only person who found that scrub too harsh! I really wanted to love it too, but alas, it wasn’t meant to be. 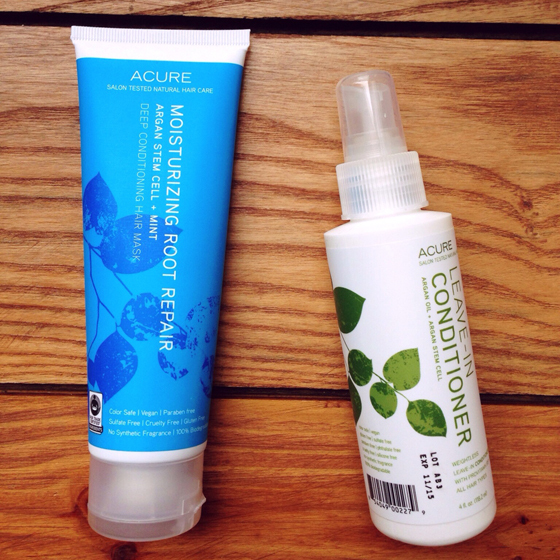 My hair needs a lot of moisture too…I love Acure’s shampoo and conditioner, but I haven’t tried the Root Repair yet. Do you notice a big difference using it versus their regular conditioners? Oh no! Maybe you can use the rest of the tube as a body scrub? Put it to good use? The Root Repair mask is like regular conditioner on crack. For me, it gives at least two times the moisture I receive from Acure’s regular conditioner/other comparable conditioners. That’s why I only use it occasionally when my hair is particularly unruly. But it really gets the job done! Acure also makes their own argan oil. This is great for dry hair (I too suffer *another tumbleweed blows by). Apply it to the ends, or everywhere thats dry really, and voila – luscious hair that smells equally amazing. I prefer it on my face – I’ve “overdone it” on my hair and ended up looking a bit greasy. But it’s my all-time favorite argan oil.